What is Workday Grants Management? 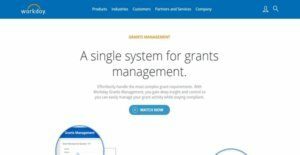 Workday Grants Management is a fully featured grant management application designed to meet the complex grant administration requirements and needs of educational institutions, government agencies, and healthcare organizations. The application provides organizations with complete visibility of all grant-related activities and enables them to simplify the management, monitoring, and reporting of grant funds, thereby improving transparency and compliance. Workday Grants Management is a part of a unified suite of Workday applications which includes Workday Financial Management, Workday Human Capital Management, Workday Time Tracking, Workday Payroll, and Workday Students This removes the barriers for data exchange and gives users a central location where they can easily perform key grant administration tasks such as grant proposal recording, proposal budget conversion, awards reporting, and post-award process automation. With Workday Grants Management, users will be able to calculate facilities and administration costs that are billable to their sponsors. They can also validate and certify the efforts of employees like principal investigators who are conducting grant-related activities. In order for them to comply with the requirements set by their sponsors, the application allows them to capture and track grant-related expenditures. They can generate detailed grant activity reports based on sponsor requirements. Moreover, Workday Grants Management helps users perform balanced accounting for awards across major business units within the organization. Workday Grants Management is built in such a way that it gives government agencies and nonprofit institutions a high level of accuracy and precision which they can’t get from other applications which primary purpose is project management. The application is different from other applications available in the SaaS market today because it is exclusively designed to capture all the subtleties associated with grants. Workday Grants Management permits users to access and comprehensively track all information related to a grant and conduct rich and multidimesional reporting. The information that they can track using the application includes award, award type, sponsor type, tasks, details on facilities and administration rate agreement. The grant management solution is a fully automated application. In fact, the application is a component of a unified suite of applications which means accurate information can be automatically shared between multiple systems, reducing manual handoffs and eliminating integration complexities and issues. Workday Grants Management effectively interoperates with other Workday applications like Workday Financial Management, and this can be observed in its revenue recognition feature. The application has a robust and configurable calculation engine that allows the automatic calculation of facility and administration costs billable to sponsors. Since the calculation engine is configurable, rules that affect how such costs are calculated can be set and modified when needed. After the costs are calculated, the financial data can be transmitted to Workday Financial Management so that the organization can recognize the amount of revenue that a particular grant can generate. Organizations that are managing and implementing programs, projects, or research rely heavily on grant funds as a large source of funding for their operations. Thus, users should be able to track how grant funds are being utilized across their organization and gain insights into all grant-related activities. Workday Grants Management provides them with the ability to access grant activity intelligence and analytics through the aid of its reporting and dashboard capabilities. The grant management application allows them to check whether actual grant expenditures are in line with the allocated grant budget. If they want to track and compare their grant expenditures across multiple grants, that is made possible. Moreover, the application lets them compare grant activities per sponsor. What’s great about this is that they will be able to access grant activity intelligence and analytics right straight from Workday without the need to use any third-party data warehouse. Effort reporting is also incorporated into Workday Grants Management as it interoperates with Workday Payroll and Workday Time Tracking which are also components of the Workday application suite. This enables researchers and other personnel to record and track the time they spent for working on a grant or activity, and at the same time, ensure that their efforts are reflecting on the payroll costs. Usually, effort reporting is a process which is done manually so it is prone to errors. However, with Workday Grants Management, this process is digitally executed, thereby eliminating data entry errors. Summing it up, Workday Grants Management automates the post-award process. A very important aspect of this process is reporting. Here, organizations need to prove their compliance with the terms and conditions specified in the grants and meet the reporting requirements of grantmaking agencies and sponsors. By taking advantage of the application’s reporting capabilities, organizations can generate accurate reports, allowing them to easily certify their compliance. If you are interested in Workday Grants Management it may also be a good idea to examine other subcategories of Best Grant Management Software gathered in our base of SaaS software reviews. Enterprises have different needs and requirements and no software application can be just right in such a condition. It is futile to try to find a perfect off-the-shelf software system that meets all your business needs. The wise thing to do would be to adapt the system for your specific requirements, worker skill levels, finances, and other elements. For these reasons, do not hasten and pay for well-publicized trendy solutions. Though these may be widely used, they may not be the best fit for your specific wants. Do your research, investigate each short-listed platform in detail, read a few Workday Grants Management reviews, speak to the seller for clarifications, and finally settle for the product that offers what you require. How Much Does Workday Grants Management Cost? Workday Grants Management’s SMB and enterprise pricing plan information is available only upon request. Please contact the company’s sale team via phone or fill out the form available on its official website for your inquiries and to get a quote. We realize that when you make a decision to buy Grant Management Software it’s important not only to see how experts evaluate it in their reviews, but also to find out if the real people and companies that buy it are actually satisfied with the product. That’s why we’ve created our behavior-based Customer Satisfaction Algorithm™ that gathers customer reviews, comments and Workday Grants Management reviews across a wide range of social media sites. The data is then presented in an easy to digest form showing how many people had positive and negative experience with Workday Grants Management. With that information at hand you should be equipped to make an informed buying decision that you won’t regret. What are Workday Grants Management pricing details? What integrations are available for Workday Grants Management? If you need more information about Workday Grants Management or you simply have a question let us know what you need and we’ll forward your request directly to the vendor.